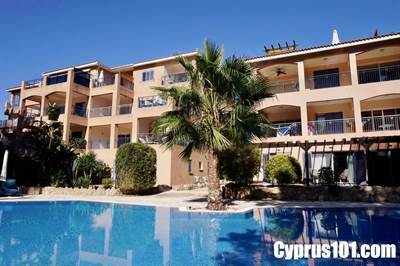 This beautifully presented second floor apartment is ideally situated in the heart of Kato Paphos, on the highly sought after resort of Paradise Gardens 4. All the amenities including picturesque harbour, local beaches and popular shopping Mall are within easy walking distance, but if you prefer to take the bus, there is a bus stop right outside the complex. It’s easy to see why the complex is called Paradise. Two impressive mosaic tiled pools with surrounding sunbathing terraces are set amongst lush landscaped gardens in a wonderfully peaceful and tranquil setting. The property for sale in Kato Paphos has been lovingly cared for and is in immaculate condition with high quality finishes throughout. The accommodation features a bright, open plan living room with comfortable lounge, dining area and fully fitted kitchen with fresh white units and wood topped breakfast bar. A wall to wall patio window in the living room provides easy access to a partially covered terrace with a fabulous rural aspect, perfect for outdoor dining and relaxing. Through a decorative archway is a hallway leading to two spacious double bedrooms with fitted wardrobes and a modern family size bathroom with walk-in shower and vanity unit. ​For those looking for a luxury holiday home and/or rental investment, this property certainly has it all. It comes fully furnished and there are full title deeds.